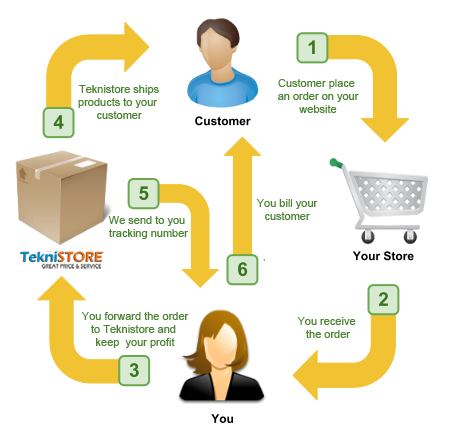 The Dropshipping is a new business model in which the Dropshipping client don't need to have goods in stock, but transfer their customers' orders and shipment details directly to teknistore.com that will send the ordered goods directly to their customers, in a totally anonymous. Dropshipping customers make profit on the price difference between the purchase on teknistore, with discounts for Dropshippers, and the final selling price applied to end customers on their sales channel. The following image shows how work the Dropshipping. As you become Dropshipper with Teknistore? Become Teknistore Dropshipper is very simple, you must first register as a customer at our website www.teknistore.com, then send an email to [email protected] indicating your registration information to the site and the URL of your online store or your sales channel (ebay, amazon, web ads, etc.). After reviewing your request we will activate your account and the reserved price list for Dropshipper so you will buy from our website at prices even lower than those already offered on our website. You are free to resell the products to your customers at prices that you feel is appropriate in order to have as profit the difference between the payment received and what you will pay to us to finalize the order. During the purchasing procedure on our website, you musi indicate how directly customer address where we will send the product for you.